HAPPY ENDING: Home, Safe n’ Sound! Yeah!! Thanks to sightings being reported immediately, her family and some helpful strangers were able to corner her in a ball field…and the bacon made her realize it was okay. Smart girl Miley. Thank you to all who reported sightings today, went out searching for her, and all our followers that cared and shared her info. It works! YIPPEE!! 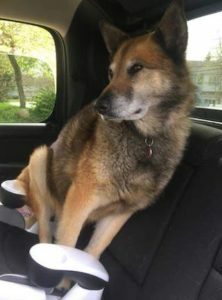 LAST SIGHTING INFO: A roaming and scared German Shepherd is in flight mode (running from people, very scared – Do Not Chase) and was first sighted by the Penhorn Transit Terminal and headed towards Baker Dr intersection and last seen on Hwy 118 between Mic Mac Mall and headed into Shubie Park via the Shubie Canal Greenway Corridor near Lakeshore Park Terrace where it eventually ran into the woods. 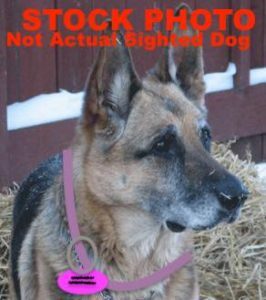 She was wearing a pink or faded red collar with distinctive bright pink bone shaped dog tag. She was a senior, with a greying face and thin body.